Despite being non elite mobs these hit as hard as level 85 raid bosses and have a plethora of anti player abilities, definitely something that should be avoided if you are in the wrong kinda crowd. Do not attempt to fight these guys; they are the pinnacle of anti-pvp guards and will massacre anyone foolish enough to engage them. Requirements: Level 80, Warrior, Human. The ally and horde versions of these guards will attack each other as well as players if they wander into their aggro range so you can lose them if you can get to your own guards in time if one is chasing you, though for some reason their counterparts are the only other npcs they will attack. They won't attack any mobs that follow you in to the base for instance. I had to delete my original comment since these guards seem to change every week or so. They use to shout players out of stealth, they do not any more. They use to net players, they do not any more. 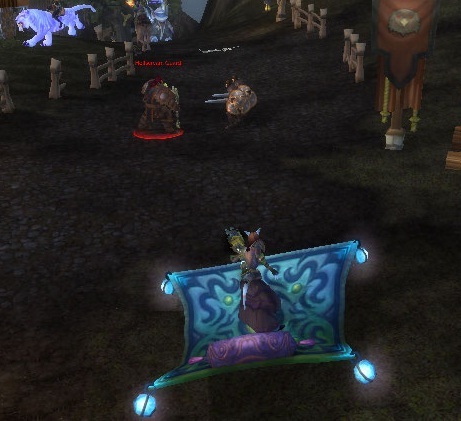 Sometimes they would not attack horde even if you were standing next to them while being attacked by range, unless they were not also right next to the guards,. Another time if you stood by the guards and used a ranged attack on a horde, the guards would run out to greet them, a different time they did nothing at all for the same actions. Этот NPC может быть найден в следующих зонах: Полуостров Тол Барад (24).